The introduction of the current Canadian flag on February 15, 1965 is a moment which has a great deal of importance for the trajectory of Canadian history. The flag, as one of the foremost symbols of a country, generally serves to promote national pride and unity. Therefore, the adoption of new one is a rare chance for people to come together behind their shared values. However, in the years leading up to 1965, Canadians were more often than not divided when it came to their vision of the flag ought to look like. This blog post examines the postwar context in which the flag debate took place, the circumstances of the actual moment, and the lasting significance of the change on Canadian history. While much has been made in Canadian historiography of the country’s Anglophone and Francophone “two solitudes,” relatively little attention has been devoted to how the flag — itself a seemingly-superficial object — fit into those narratives of linguistic and cultural confrontation. In the years after World War II, Canadians wrestled with the challenge of coming into their own as a country. Though the war-as-independence narrative is in many ways overwrought, it remains that Canadians began to see themselves as a distinct nation through their involvement in the conflict, and their emergence from it as a bona fide middle power. One of the first arenas in which Canadians began to fully assert their independence in the postwar period was international trade. Initially, the conventional wisdom among political and economic decision-makers was that maintaining close ties with the United States was the best way for Canada to ensure its future prosperity. By 1955, with the full support of the government, foreign investment in Canada had more than doubled since the start of the war, to $13.5 billion annually. However, many were soon put off by American excesses, such as Senator Joseph McCarthy’s infamous anti-communist crusade. Consequently, when a royal commission on the country’s future “economic prospects” was convened by the Liberal government in 1956, its chair, a staunch nationalist by the name of Walter L. Gordon, devoted a great deal of time to warning about what he saw as the dangers of too much “foreign ownership” of Canadian resources and industries. Traditional economists scoffed, but newspaper editorials raved when the commission’s report recommended that the government require foreign firms to employ more Canadians, or face steep tariffs. While little actually came of the text, Gordon did successfully provoke the country into thinking more critically about how to cultivate an identity apart from its larger neighbours. The same year Gordon sent the country into a frenzy over foreign ownership, Canada also split heavily from Britain in the Suez Crisis. The Crisis began when Egyptian President Gamal Abdel-Nasser moved to nationalize the Suez Canal, a key link in the shipping lanes between Europe and Asia. In retaliation, Britain and France invaded Egypt. The Soviet Union supported Nasser, while the United States, fearing a nuclear war, tried and failed to convince the British to back off. Amid the escalation, and with a rift forming in the Anglo-American alliance, then-Foreign Minister Lester B. Pearson of Canada found an opening. In a marked contrast to its former colonial master, Pearson’s Canada led a successful campaign to deploy an international peacekeeping force to the region. The United Nations approved the mission, Canadian troops were sent in, and, under great international pressure, the deeply-humbled British were forced to withdraw. For his efforts, Pearson took home the Nobel Peace Prize the next year, and was later elected Prime Minister in 1963. 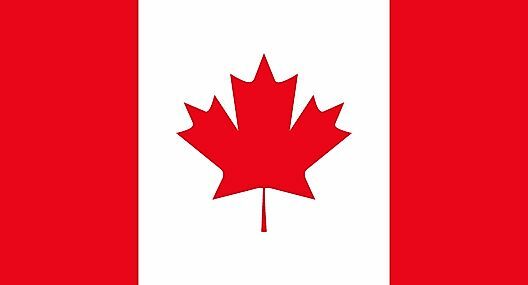 During the 1963 campaign, Pearson promised to, among other things, introduce a new flag for Canada within two years, in plenty of time for the country’s centennial. Pearson’s interest in the flag arose during the 1956 Crisis, when Nasser expressed concern about the presence of Canadian peacekeepers partly because the Canadian flags on their uniforms incorporated the British union jack. This first Canadian flag, commonly known as the Red Ensign, was made up of a solid red field with the union jack in the top left. On the right was a shield incorporating the symbols of each province, which became more and more cluttered as new provinces joined confederation and individual flag makers added their own embellishments. Though the design was eventually standardized by the 1950s, Pearson was nonetheless convinced by his experience in the Suez Crisis that Canada needed to start from scratch if it wanted to be seen as a state in its own right, and not just a British colonial outpost. After winning the 1963 election, Pearson formed a parliamentary committee to consider new designs. A previous foray into the flag discussion in the 1940s had produced over 2,600 public submissions of potential designs, but none were ever adopted in the face of substantial opposition. This time around, too, Pearson faced blowback from John Diefenbaker, his predecessor as prime minister and leader of the Conservative Party. Under Diefenbaker, the Conservatives held that there was nothing wrong with the Red Ensign. Many Anglophone Canadians, especially in older generations, felt great attachment to an idealized version of Canada that was distinctly British-flavoured. They saw no need to distance the country from what they saw was its rightful place as part of a “family” of nations of British descent. Diefenbaker argued that there were far more serious matters to attend to, and that changing the flag would furthermore be a slap in the face to the veterans who had fought under it during both World Wars. In his speech at the ceremony, Pearson triumphantly proclaimed, “If our nation, by God’s grace, endures a thousand years, this day… will always be remembered as a milestone in Canada’s national progress.” Pearson felt so strongly about the flag because he gauged that without it, the country was at risk of breaking apart entirely. The 1960s were in particular a time of great social tumult in the province of Quebec, and separatist sentiment there was growing as discontent with the status quo brewed. Canada, “perhaps without being fully conscious of the fact,” was in the midst of a great and prolonged crisis. Missing, however, from historical coverage and analysis of this moment is the input of Canada’s Indigenous populations. From the outset, “the proposed flag’s distinctiveness derived from the absence of all marks of Canada’s two founding races, French and English.” The exclusion may have worked for Pearson at the time, but the entire notion of the French and English being the country’s “two founding races” sorely erases the existence of Indigenous people from Canadian history. Furthermore, the very foundation of Quebec nationalism in the context of the flag debate — the notion that Quebecers are subjugated by the Anglophone majority — neglects the fact that Indigenous people have faced oppression, discrimination, and cultural genocide under both regimes. Albinski, Henry S. “Politics and Biculturalism in Canada: The Flag Debate” In Australian Journal of Politics and History vol. 13, no. 2. Brisbane: University of Queensland Press, 1967. pp. 169-188. Azzi, Stephen. Walter Gordon and the Rise of Canadian Nationalism. Montreal: McGill-Queens University Press, 1999. English, John. The Worldly Years: The Life of Lester Pearson, 1949-1972. Toronto: Vintage, 1993. Fraser, Alistair B. “A Canadian Flag for Canada.” In Journal of Canadian Studies vol. 25, no. 4. Peterborough, Ont. : Trent University Press, 1990. pp. 64-81. Levine, Allan. “The Great Flag Debate.” In Canada’s History, February-March 2015. Accessed at http://www.canadashistory.ca/Explore/Politics-Law/The-Great-Flag-Debate. Stephen Azzi, Walter Gordon and the Rise of Canadian Nationalism, (Montreal: McGill-Queens University Press, 1999), p. 35. John English, The Worldly Years: The Life of Lester Pearson, 1949-1972, (Toronto: Vintage, 1993), p. 140. Government of Canada, “History of the National Flag of Canada,” in Canadian Heritage. Accessed at https://www.canada.ca/en/canadian-heritage/services/flag-canada-history.html. Allan Levine, “The Great Flag Debate,” in Canada’s History, February-March 2015. Accessed at http://www.canadashistory.ca/Explore/Politics-Law/The-Great-Flag-Debate. Henry S. Albinski, “Politics and Biculturalism in Canada: The Flag Debate,” in Australian Journal of Politics and History vol. 13, no. 2, (Brisbane: University of Queensland Press, 1967), p. 170. Albinski, “Politics and Biculturalism in Canada,” p. 169. Albinski, “Politics and Biculturalism in Canada,” p. 170. Published by charlesdabda on April 10, 2018 at 1:48 pm under Uncategorized.